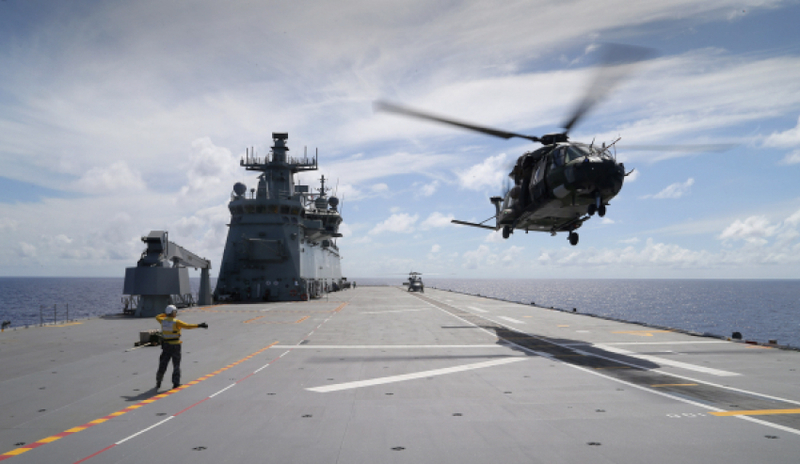 Forensic engineers from Defence Science and Technology (DST) Group have been providing advice to ensure the safety of the MRH90 aircraft, following an incident aboard HMAS Canberra. Australia’s MRH90 helicopter has experienced a series of serious incidents since its introduction into service, with similar incidents occurring across the world fleet. The latest incident involved an Australian MRH90 Navy helicopter aboard HMAS Canberra, where excessive updrafts of wind coming up the side of the ship during the helicopter shutdown process caused the helicopter blades to act erratically leading to unfavourable blade orientation. DST Group said its staff were able to provide urgent and timely advice on the cause of these incidents so that appropriate measures can be put in place. A forensic investigation involving Capability Acquisition and Sustainment Group, Airbus Group Australia Pacific and DST Group was integral to the MRH90 returning immediately to service, and being able to participate in the world’s largest international maritime exercise, RIMPAC which occurred the next day. A DST Group team, led by defence researcher Robert Toffoletto, is also looking into multi-aircraft operations, a situation DST Group said is unique to HMAS Canberra. HMAS Canberra, the first of two Canberra-class landing helicopter dock (LHD) ships to join Australia’s Navy fleet, has six helicopter landing spots; while most other Navy ships have only one. This means that there may be a scenario on the LHD where a Chinook helicopter is on the deck at the same time as an MRH90. "In terms of our aerodynamic expertise, we need to work out what are the safety implications of having multiple, different sized helicopters operating on the deck at the same time," Toffoletto explains. DST’s expertise in forensic engineering and helicopter systems analysis, coupled with collaborative engagement with the original equipment manufacturers such as Airbus Group and Boeing, is helping to minimise safety incidents and maximise the safety of helicopter operations at sea.